Choosing to pinstripe your car, truck, SUV, trailer or boat gives it that finished look and adds value. if you choose to sell it. Vinyl(tape) pinstripes come in a multitude of colors, sizes and designs. We can add pin striping to your automobile, larger pick-up trucks, trailers, vans and sports cars. Car-Knack uses only professional grade vinyl materials for all vinyl pinstripes, decals and graphics. Isn’t it about time for you to add a personalized touch to your vehicle? We are sure to have something you will like, if not, many things that you will love. We have the vehicle graphics or pin striping that you will need to add any style to your vehicle. It really doesn’t matter what you drive, we have tons of car decals, racing stripes and vinyl pin striping to choose from. The great thing about our racing stripes, graphics and pin striping is that they look great on any car, truck, SUV, trailer or boat. Make your car look different by creating more of an extension of your unique personality. 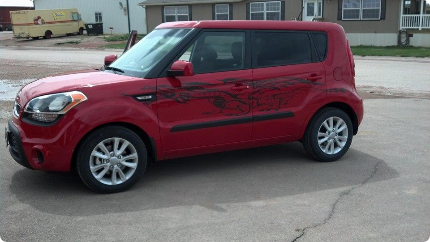 Adding Vinyl striping to your vehicle will enhance its appearance and value for years to come.